Takeaway: Hydroponic systems come in many forms, but solution culture systems may be the purest. That’s because in float, raft, raceway, pond, deed flow technique, and nutrient film technique systems, roots are suspended in water and not buried in a soilless medium. Read on to learn more. 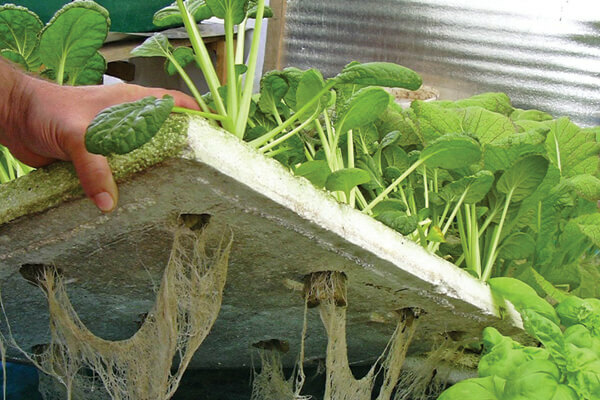 Solution culture systems are often seen as the purest form of hydroponics as plant roots are suspended in nutrient-rich water and only a minimal amount of substrate is used to support the plant. These types of systems were also at the forefront of hydroponic research and development in the earliest days of soilless culture. During this time, the simplest solution culture vessels were large glass jars of nutrient solution into which air was bubbled. The plant was supported by cardboard, cotton wool, or other materials at the top. Such experiments demonstrated that plants did not require soil or any other solid substrate to grow. Those early solution culture trials eventually evolved into a wide range of crop production systems used for organic and non-organic hobby and commercial grows. Along with nutrient film technique (NFT), solution culture incorporates many innovative variations of float, raft, raceway, pond, and deep flow technique (DFT) systems. Solution culture is also incorporated into aquaponics, where fish production and hydroponic crops are combined. 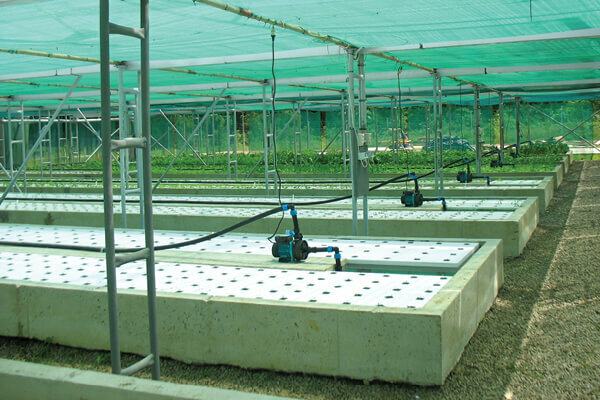 Commercially, float systems are used to produce vegetable crops such as lettuce, herbs, and other greens. They are also used to raise field transplants. These systems allow growers to evenly water the young seedlings while feeding them a well-balanced nutrient solution that can be adjusted in composition and strength during the critical stages of development before seedlings are transplanted out in the field. Under greenhouse production, large-scale float systems maximize the growing area as the need for pathways is reduced and automation can be adopted where required. On a smaller scale, mini raft systems can be set up with as little as a plastic container, some polystyrene sheet, and a well-balanced nutrient solution, making these systems ideal learning tools for younger students and those with restricted space. Float, raft, and pond systems are methods of solution culture where plants are supported by a sheet of lightweight material, typically polystyrene, that floats on the surface of a large pond of nutrient solution. Seedlings are usually raised in a separate nursery area, sown into either blocks of inert propagation media like stone wool or into small tubes or lattice pots of substrate. Once the seedlings have reached an optimal size, they are inserted into holes cut into the floating rafts and set adrift on the nutrient pond. Roots develop down into the nutrient solution, which supplies mineral elements and dissolved oxygen for root respiration. The top of the plant develops supported only by the raft (a fact that does limit the types of crops growers can choose to cultivate). The rafts of plants are easily moved over the surface of the nutrient pond with a gentle push as the floats act as a frictionless conveyor. In larger ponds or raceways, floats of new seedlings are introduced at one end of the nutrient pool and gradually move towards the opposite end as the plants mature. At the furthest end, floats are lifted for plant removal at harvest before being cleaned and replanted with new seedlings. Larger plants like tomatoes, cucumbers, and melons use similar set-ups in which the crops are stationary and supported by overhead wires. Often, these are DFT systems, meaning the nutrient solution flows past the roots. The continual flow of the solution in DFT systems prevents stagnation and delivers fresh supplies of dissolved oxygen to the root system. While float or DFT systems may seem like simple methods of growing a wide range of crops, solution culture has several principles growers must adhere to. Firstly, plants can easily suffocate if there is insufficient oxygen in the root zone. Roots require oxygen, which they either take up as oxygen gas (O2) directly from the air or as dissolved oxygen from moisture surrounding the root surface. Without it, water and nutrient uptake is restricted, roots die off, and opportunist pathogens such as pythium rapidly attack. While the air-filled pores in a growing substrate contain atmospheric oxygen at high levels (air is 21 per cent oxygen), nutrient solution can only maintain six to 13 parts per million (ppm) of O2 at saturation, depending on temperature. Thus, growers need to keep their solution culture systems adequately oxygenated for plant growth. Oxygenation in float or DFT systems can be provided via air pumps, injector systems, or nutrient circulation. In the latter, air bubbles produced when the solution cascades back into the pond or reservoir replenish the dissolved oxygen levels. In small, basic raft systems built where electricity is unreliable or not available to continually power pumps and timers, hand aeration by agitation or whisking of the nutrient solution can be used to increase dissolved oxygen levels. The second principal of float systems or DFT is nutrient solution management. The large volume of nutrient solution in the system acts as a buffer to slow changes in temperature, electrical conductivity (EC), pH, and elemental levels, but they still need monitoring and adjustment. As with any system that continually recirculates the nutrient solution, the ratio of elements can become unbalanced over time as the crop takes up some nutrients in larger amounts than others. The accumulation of unwanted salts such as sodium can also occur. Larger commercial systems normally carry out regular nutrient solution monitoring and adjustment, but it’s possible to manage smaller indoor float systems with an occasional partial or complete replacement of the nutrient solution. Management of the nutrient solution may, in some environments, include temperature control. Under warm, tropical conditions, the nutrient solution pond is chilled to grow crops, such as lettuce, that would otherwise struggle to develop and yield well in excessive heat. In cooler climates, the nutrient pool can be heated to improve nutrient uptake and growth rates. The depth or volume of the nutrient pool is also of importance. Crops produced in nutrient pools with an average depth of seven to eight centimeters have been found to perform less consistently than those grown at depths of 12-23 centimeters. Deeper pools offer more buffering capacity to changes in solution variables and thus are likely to be more productive. With float systems, there is a risk of rapid disease spread. 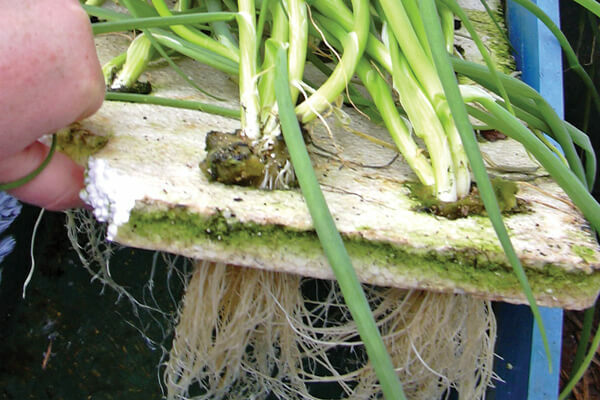 Root rot pathogens such as pythium, which produce free-swimming zoospores, can be transported around recirculating systems via the nutrient solution, potentially infecting a large number of plants in the process. To help prevent this, commercial growers can construct smaller individual ponds that isolate disease outbreak and minimize plant losses. Ensuring temperatures are within range, EC levels are optimal, and sufficient oxygenation is provided for root health also helps. Other approaches, similar to those used in other types of recirculating nutrient systems, include using microbial inoculants to assist in suppressing disease pathogens and using nutrient sterilization techniques such as ozone, heat, slow sand filtration, or UV treatment. Float systems are ideal for indoor gardens where space is limited or where a crop needs a different EC than others in the growroom. 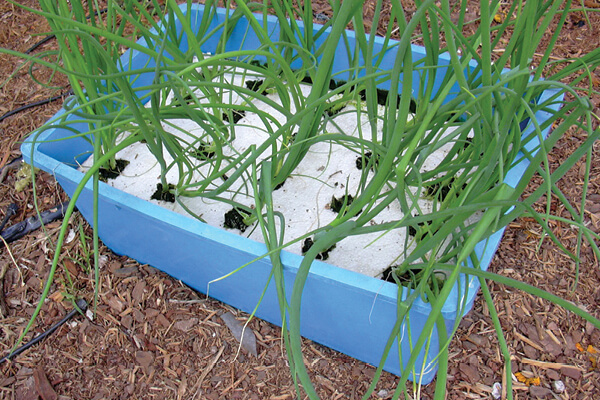 All that is required for the nutrient pool on which the plants will float is a container (food safe, preferably) with a depth of at least four to six inches. The length and width of the container depend on the number of plants to be grown. Most medium-sized lettuce grows at a spacing of eight to 10 inches square, but baby leaf greens and many herbs can be planted at a higher density. There are many material options to choose from when making small-scale raft systems. Hydroponic pond systems have been constructed from children’s paddling pools, fish tanks, glass aquariums, food storage containers, buckets, and plastic-lined timber frames—anything that creates a leakproof, lightproof, and level container works. The floats can be constructed from closed-cell polystyrene, which is available from hardware stores. The polystyrene should ideally be 25-40 millimeters thick for maximum flotation, and the float should be restricted to a size that can be easily handled and lifted from the surface of the nutrient pool once plants are mature. Holes in the dimensions of the tubes or pots used to hold the plants are then cut or burnt into the float. The nutrient solution used to fill the pond should be well-balanced and suited to the plants being grown. Water supplies with high levels of unwanted minerals such as sodium make for nutrient solutions that need more frequent replacement than those made using high-quality or reverse osmosis water supplies because these elements will build up over time. All nutrient solutions can then be managed by checking the EC and pH, then either adding more nutrient concentrate to bring the EC up or adding water to lower the EC. Acid can be used to adjust pH. Keep in mind that while some raft systems work on a principal of topping up with nutrient solution to a predetermined level as required during crop growth, others are run as nonadjustable systems where no additions of water or nutrients are added to the system throughout the crop’s life. After harvest in the latter type of systems, the nutrient solution is replaced and new plants are installed for the next crop. Float and DFT systems for indoor gardening are easy to construct and require minimal attention once set up properly. These can be used as a small separate system in an indoor garden to produce lettuce, herbs, and salad greens requiring a different nutrient balance and EC to many other flowering and fruiting crops. 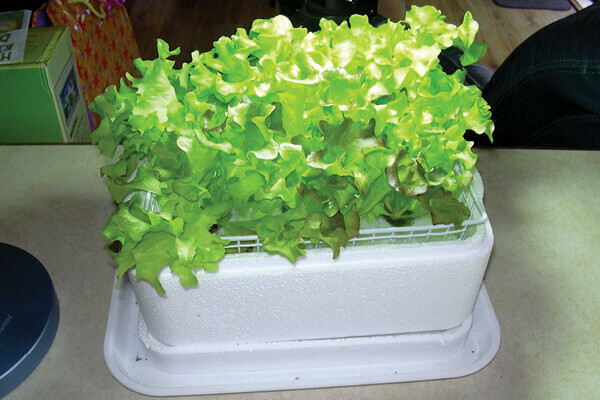 Small float systems are also great low-cost educational tools for students that allow regular observation of root system development and offer some practical experience with hydroponic methods.